Some time back we wrote about the Portuguese American Civic Club, or, as it was and is affectionately known as, the P.A.C.C. Now there is more to share thanks to John Arruda, current President of the P.A.C.C., for providing copies of the archives of the Club with me. Within the material he sent was a C.D. which included this wonderful photo. The best thing about it is that two of my uncles are in the photo: John Bernadino (Middle back row) and John "Bunny" Souza ( left front row). Most of these other gentlemen were well known to me as well. 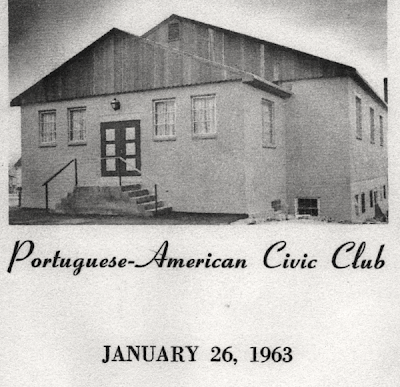 1945 Board of Directors: Portuguese American Civic Club. 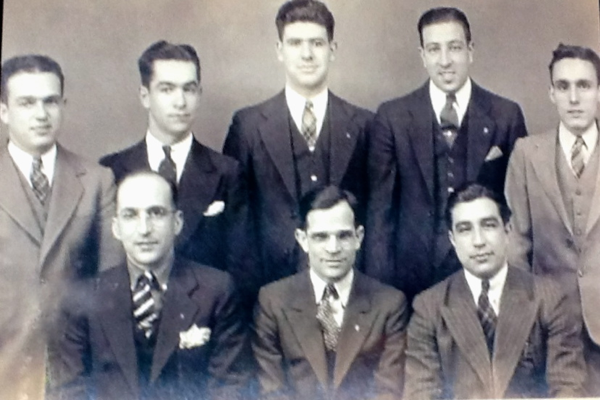 Back row: left to right: Frank Rico, Larry Fontes, John Bernadino, Mr. Pacheco and unknown gentlemen. Front- John Sousa, Frank Rose and John Souza. John Bernadino was President 1949-1950.
on the occasion of the opening of the upstairs hall. 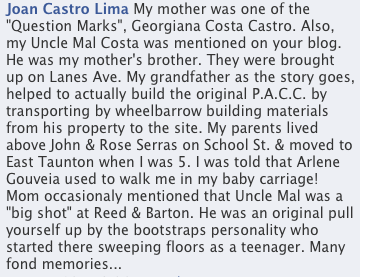 I recall "Mal" Costa and his wife Irene as well. The P.A.C.C. is part and parcel of Village history. It was founded in 1929! The founders were a group of Portuguese immigrants whose names are mostly lost to us today, except that the first President appears to have been Joaquim Ferreira who served from 1929-1931. They once met in a neighborhood store on School Street and also upstairs in a funeral parlor. In 1930 a building was rented next to the neighbor at the left of the current P.A.C.C. for $10 a month. With second hand furnishings it must have been like a boy's club: table, 20 chairs and a small railroad car heater. It is true that there were 30 members but it was figured not all would show up at the same time. The men's room was at the end of the lot, as was common it was a one seat out-house. The dues were $.25 a month. They were there for a year then moved to the Sports Medeirence Club across from Lane's Avenue. Bigger than the last space, the rent was higher: $35.00 a month. and soon after the dues went up $.50 a month. This was at the beginning of the Great Depression when the average family did not have enough to buy more than food. Many of the members worked as janitor and bartender for a year's dues. Because of an increase in members they began to promote fund raising activities. For the most part those were dances and whist parties (a staple of Church fundraising, too). and a good example of fundraising entertainment activities. I remember Minstral shows at the Church, too. Thanks to Janice Costa Treano from the Village for this great shot. 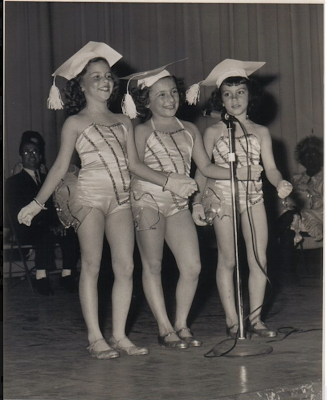 Janice is on the far left, then Carol Rico and Terry Oliver. Carnivals were sponsored, too, which swelled the Treasury. In 1933 the Ladies Auxilary was born, a group of high school girls headed by Emma Andrade. Emma lists herself as "still active". Aunt Emma, as I call her, is still with us today. The members of the P.A.C.C. attribute much of their success to this Auxiliary. 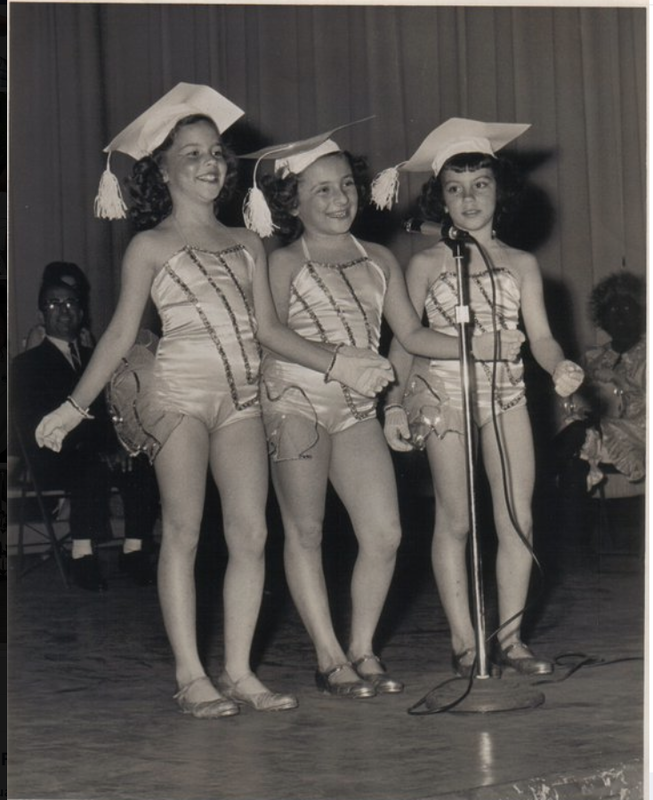 The following is a history of that group as told to Arlene Gouveia by Emma herself and Jeanette Nascimento ( a non-member). 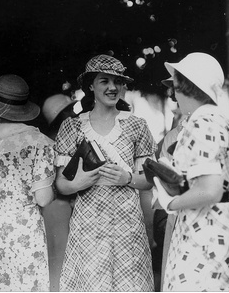 "In February of 1933 twelve lucky girls formed a club called The Question Mark Club. Sixty five years later 6 of the 12 were still active members." give us a timeline for the P.A.C.C. which is great. as it helps to picture what those gals wore back then. That date of 1933 also tells us when the great P.A.C.C. 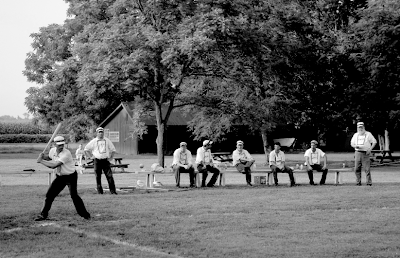 baseball teams were organized and sponsored becoming City Champions. The photo below is not of any Taunton group but from the Internet, it still gives us an idea of what teams looked like back then. for one and all. When they played at Hopewell Park against the Polish Club or the D. and M. Garage all who were able to walk could be found at the Park. The games made fans of folks who did not know what a baseball looked like. Every player was an idol to people of the Village. During the Great Depression the P.A.C.C. showed its loyalty to the Village with their presence being felt in whole new way. Mindful of unemployed members, an employment committee was organized. It was very successful in placing men in jobs in city, state, county and even federal projects as well as private employment. The men with the largest families had first priority. Many a member of the committee, out of work himself would give up a chance for a job to someone in greater need. At the time national income was cut in half and a quarter of the work force was unemployed. Malnutrition occurred in big cities. Yet the Village, between its people, its Church and the Club managed through it all. by someone of Portuguese descent. In 1938 the need for a larger building became evident and the land where the current P.A.C.C.is located was purchased. Shortly after, that under John Abreau as President and Frank Rico as chair of the building committee, they went ahead, mostly with the muscle of their members. The second floor was added in 1965. The Club reflected Village life. Festas took place there, and carnivals. All a short walk from the homes of the Village. Growing up right across the street from the age of 12 years old, I can attest to the respect Club members had for the Village. We were never disturbed by loud music or disruption of any kind. My grandfather died in 1927, I like to think he was part of the group that planned organizing this Club. My father was active at the P.A.C.C. as well as my uncles and probably my aunts as well. Addendum: There have been so many folks sharing their memories on the Facebook page I'M FROM TAUNTON, it has been so gratifying. I am adding this one which particularly touched me, as I knew this family so well… Somehow the P.A.C.C. post tied so many memories together. Thanks, Joan. I am grateful to those who contributed to this post, it was an honor to write it. Some of the photos are from Pinterest but serve to illustrate the story. Keep up the storytelling, folks, stories give us an identity, a sense of pride in where we grew up and those who came before us. The nice part is that I still remember so many of these names. I have great memories of St. Anthony school which I attended from k - 5 1965. I have so many memories of car pooling there, Mrs. Procopio's Kindergarten Class, Ms. Doraz who was my 5th grade teacher and Mrs. Carew.